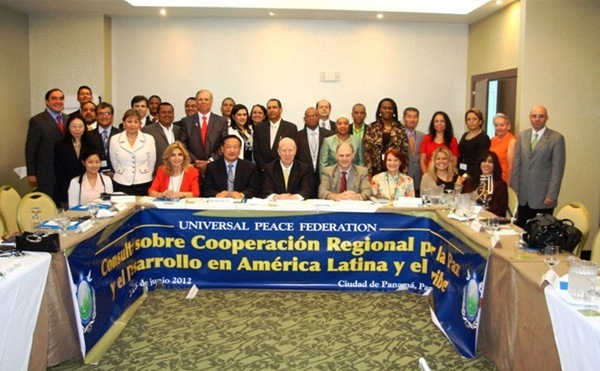 Lima, Peru -- The past few weeks have proved to be a busy time for Ambassadors for Peace in Peru. Following on from the successful celebration of the International Day of Families in the Congress on May 25, a number of Ambassadors attended the opening of "Bethlehem Park" in the district of San Miguel. The event was organized by the Ambassador for Palestine in Peru, Dr. Walid Abdel Rahim; the Mayor of San Miguel, Mr. Salvador Heresi; and Ambassador for Peace Mr. Damin Awad, President of the Islamic Association of Peru. The dedication ceremony for this memorial park was held in the presence of Ambassadors from Algeria, Turkey, and Nicaragua together with a number of religious leaders representing the Catholic church, the Orthodox Church, the Islamic community, and Evangelical Christian churches. Dr. Trevor Jones, UPF-President, took the opportunity to share about the work of UPF and invited them to attend future meetings. Amb. Walid expressed his appreciation for the work of UPF and offered to arrange meetings with members of the government in Palestine the next time UPF holds an international event in Israel. The following weekend, Dr. Jones was invited to attend a special service in the Orthodox Church celebrating the Feast of the Holy Trinity. The priest, Rev. Padre Sergio Benavides Luengo from Chile, and his congregation had recently completed a work project in the church, which is now beautifully restored and with a very warm atmosphere. Dr. Trevor Jones opened the evening with a summary of the objectives of UPF and the recent work in Peru that included a visit by a team from the Global Peace Academy. A musical interlude was provided by a young dancer who demonstrated the art of Scissors Dancing, a traditional and skillful dance from the Andean region of Peru. At the end of the program a local TV station interviewed Dr. Trevor Jones and Gen. Hector Jhon Caro, asking about the work of UPF in Peru. These interviews are now available on Youtube. The invited audience included a number of past Presidents of UPF as well as some newly appointed Ambassadors for Peace, who all expressed their appreciation for the evening program and their desire to work more for peace in Peru. The following weekend Past President Gen. Jhon Caro spoke at a conference organized by a branch of the Ministry of Education. He emphasized the vision of Rev. Moon that loving families are the cornerstone of a peaceful society. The event concluded with the appointment of new Ambassadors for Peace. During the same weekend, Congressman Dr. Yonhy Lescano attended an International Leadership Conference in Panama, representing UPF-Peru. The month ended with UPF supporting a press conference announcing a seminar for 2000 women in July that will be held in the "Pentagonito" (Headquarters of the Peruvian Ministry of Defense) that UPF is co-sponsoring.